THE Commission on Elections (Comelec) in Baguio City appealed partners in the conduct of the May 2019 polls to observe synergy as a way to achieve a peaceful and credible elections. 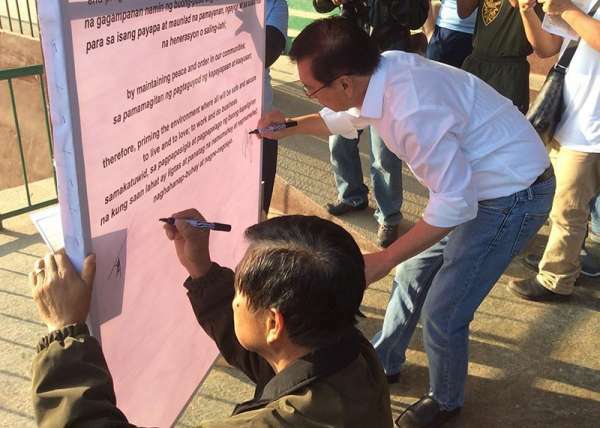 During the solidarity walk and peace signing covenant sponsored by the Baguio City Police Office (BCPO) attended by various religious sectors, government line agencies, and candidates, Baguio City election supervisor John Paul Martin pointed out the need for all partners of Comelec having different orientations working for one common goal. “Comelec alone cannot run and initiate elections because it needs all sectors to why we need solidarity. This broad word has many synonyms like partnership, coordination and cooperation, but the prompt word for purposes of the elections is synergy,” Martin explained. The election supervisor said what one can achieved must be added to what another can do resulting into what one million people can do. “We could not synergies if we all do not have one common goal. The secret of synergy especially to all the partners of Comelec is the focusing on each and everyone’s strengths and not look at the failure of organizations,” the Attorney stated. Martin explained the services of teachers are tapped due to their patience and integrity, the police and military because of their law enforcement commitment while candidates are present because they are expected to be obedient to the laws and rules, and the tapping of the religious sectors for faith. “For this and other succeeding elections, I implore synergy between and among us. There are many issues happening in the different parts of the region like criminality which is why we have this solidarity walk, but we are lucky in Baguio and we hope to maintain a peaceful elections and beyond,” Martin added.